We make a lot of our own preserves with our harvest each year. 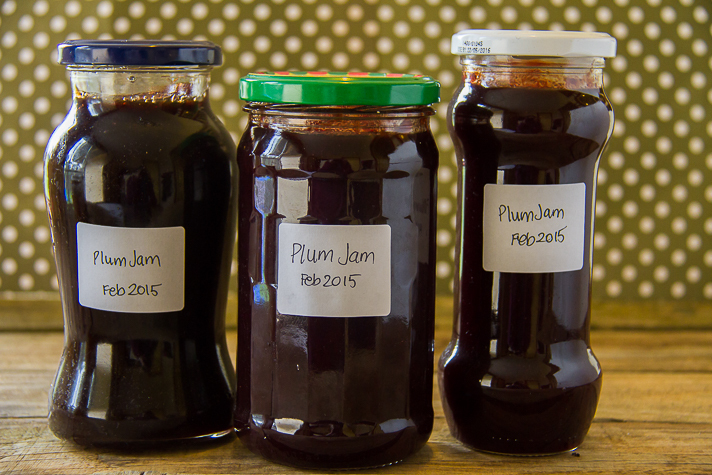 Jams, sauces, chutney, and pickles (check out my recipe page for links to lots of recipes). Most we use, and some we give away to friends or donate to our local harvest festival. The longer we live here, the more I am learning about how to preserve all kinds of foods, and the more I appreciate having a supply of home made food on hand. The bottom shelf of our linen press has been given over to jars of passata, jam, and pickles, while under the bed in the spare room is a box containing relishes and more pickles. I often joke if we ever “need” to start an isolationist cult, we have the food ready! Pickling and preserving like we do, we are always on the look out for spare jars to pop our preserved goodies into. Luckily (or perhaps not, depending on your point of view) we have developed a bit of a reputation around here for our self sufficiency habits, so some of our neighbours and friends send us boxes of second hand jars from time to time. Of course not every jar is suitable to reuse, and all jars need some preparation before you can reuse them. So if you are wanting to make your own jams and preserves, here is how to get the right jars, and prepare them. To begin with, jars that have had garlic, or other strongly flavoured foods in them, can really only be used for that same type of food. No amount of soap, scrubbing, and airing will entirely shift the garlic flavour. Trust me when I say plum jam, with over tones of garlic, is not tasty. So give the jars a sniff to see if they really smell of a certain food. Just toss any really smelly ones straight into the recycling bin. 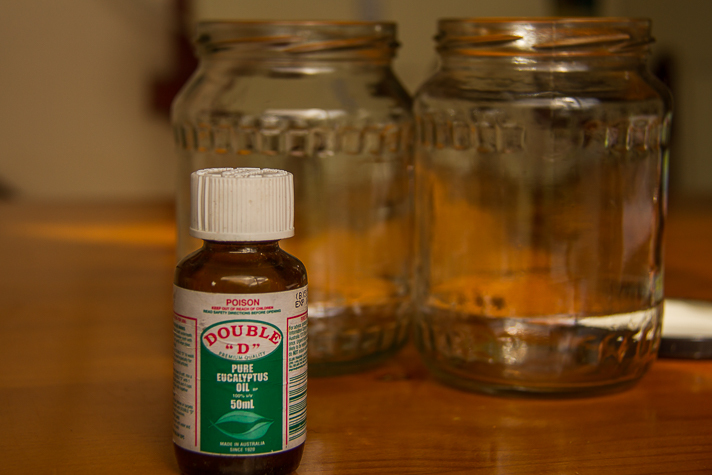 It is possible to remove slight odours from the jar easily (more below in a moment). 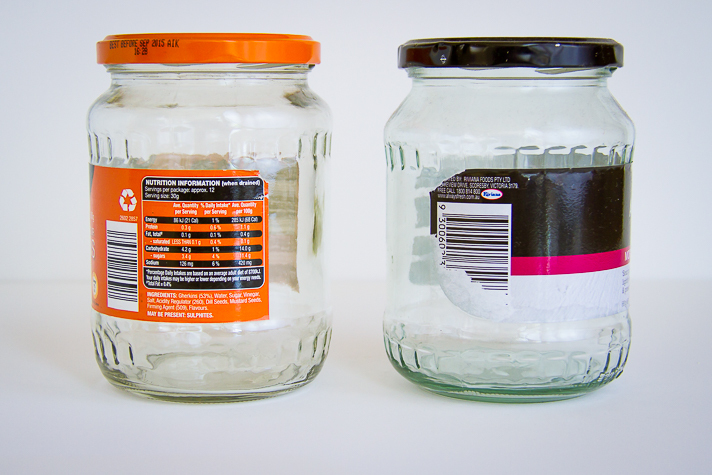 Jars with plastic lids, or lids that have been damaged are also not suitable because they can not be sterilised well (plastic) and both are hard to form a good seal with once the food is in the jar. I find that those jars with a rubber seal are also a bit temperamental, and do not always seal well either. Wash all the jars in hot soapy water. If paper labels are attached, allow them to soak for at least half an hour before trying to remove the label. In my experience there are two ways labels are glued on. The first way is with a small amount of glue. These labels will peel off easily after soaking, and may require a little scrub just to remove the last of the glue residue. 1. Use some steel wool to scratch as much of the paper and glue off as possible. 2. Get some eucalyptus oil and rub a small amount all over the glue with your fingers. Allow it to sit for a few minutes. 3. Pour some undiluted dish detergent over the label and rub with your fingers or a scourer. This should lift away the gluey residue. If there is a lot you may need to do this several times to remove all the residue. 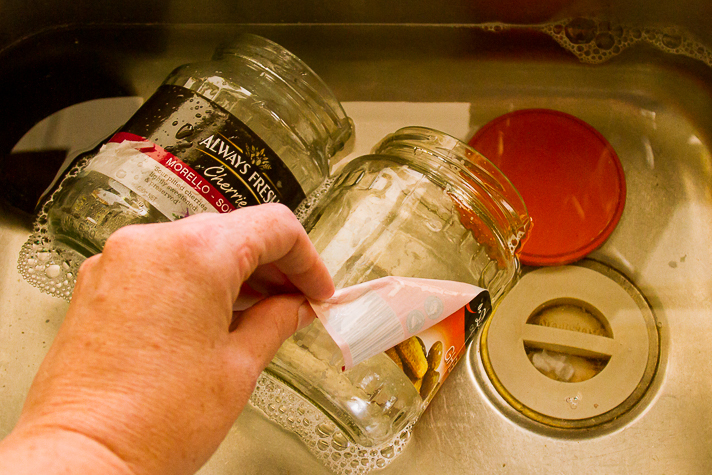 Once the glue and label have been removed, was thoroughly wash the jars again, and allow to drain on a clean dish drainer (don’t dry with a tea towel as you do not want cloth fibres in the jar). Once they are dry, place all the jars on baking tray and place in the oven at 120*c for 20 minutes. Placing the jars in the oven, also eliminates slight odours that might still be in the jar. It won’t shift the really strong pickled garlic smells, but gentler odours will disappear. If you’re not sure, pop the jar in the oven, and give it another sniff when it comes out. Once the jars are removed fill them immediately with the hot preserve, and seal. 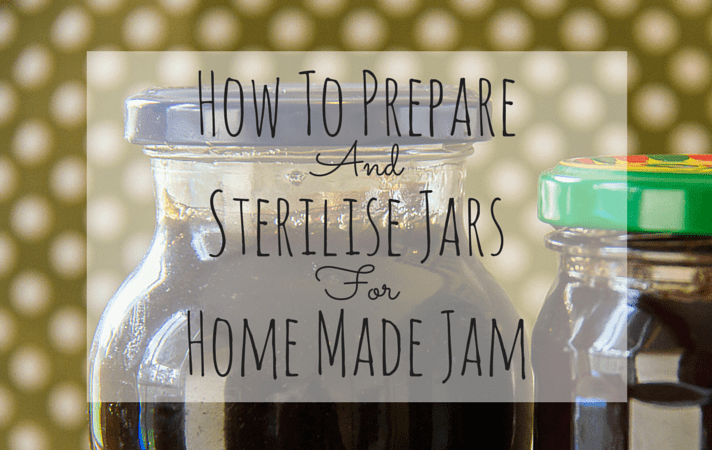 You can also sterilise jars in a dishwasher (I dream of having a dishwasher!). The lids, like the jars need to be washed in hot, soapy water, before being rinsed and dried. Be sure to really scrub in the grooves to make sure there is no food residue stuck in there. Lids cannot be placed in the oven if they have any plastic sealant on the inside, though they can be placed in a dishwasher, boiled for a short time, or even placed in a microwave baby bottle steriliser. Once the jam has been put in the jars, it is important to get those lids on tight. Ideally put the lids on while the jam is super hot (be careful not to burn yourself). You can tell if the seal is good, if the pop top of the jar ‘pops’ back down once the jam has cooled. You can also get jam sealing covers that look like cellophane, which can be used to seal the jars with an elastic band (don’t use cellophane – they are completely different products even if they look similar). Look for them in the baking section of your supermarket (probably up on the top shelf). Making your own preserves is really quite easy. They taste better than the shop bought equivalent, and they are cheaper too. Look out for boxes of in season fruit or trees on the side of the road. Give it a try! Do you preserve your own food? Have you ever thought of having a go at it? Do you have enough food to start your own isolationist cult? To get the really sticky glue of jars, I do the following: make a paste using vegetable oil and bicarbonate of soda, smear this over the glue, wait 10 minutes then rub with a scouring pad, rinsing the pad as you go. The glue lifts off. This technique means I can reuse almost any jar. Also, I buy new lids as I find the smell of strong foods is hard to get out of the lids. That's such a clear and logical explanation. I have all these jars ready but hadn't quite worked out the preparation for them. The sites I've read previously didn't explain it with enough detail. Your's has! Thank you!